my bare cupboard: Choux au craquelin/crispy green tea cookie cream puffs "
Choux is a French pastry made from milk, butter, flour and eggs, these ingredients are cooked to form a dough then baked. There is no leavening agent in this pastry, it relies on the steam from the cooked dough to puff up with almost hollow interior when baked. 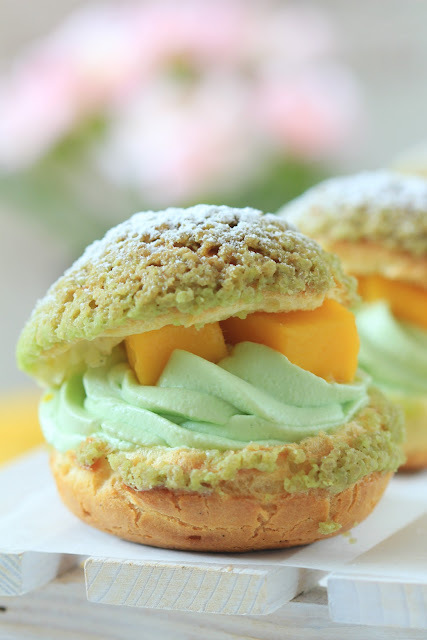 Choux is a versatile pastry, it can be filled with ice cream, pastry cream or in my case, whipped cream. You can use it for making eclairs, Paris-brest or the show-stopping croquembouche to name a few. 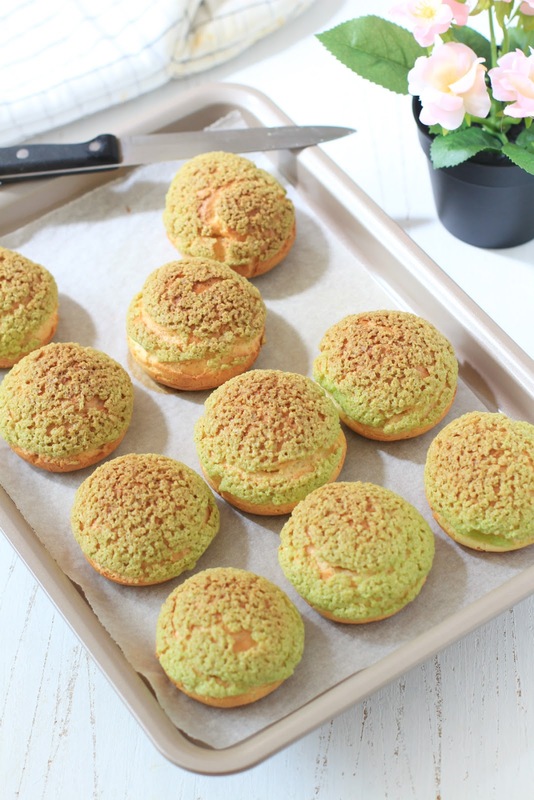 Choux au craquelin is a choux pastry with cookie dough added on top. The topping adds a delicious crips layer when baked and almost the same texture as that of Mexican or pineapple buns. I added some green tea powder both for flavour and colour. * In a small saucepan, combine the cream, milk, sugar and salt. 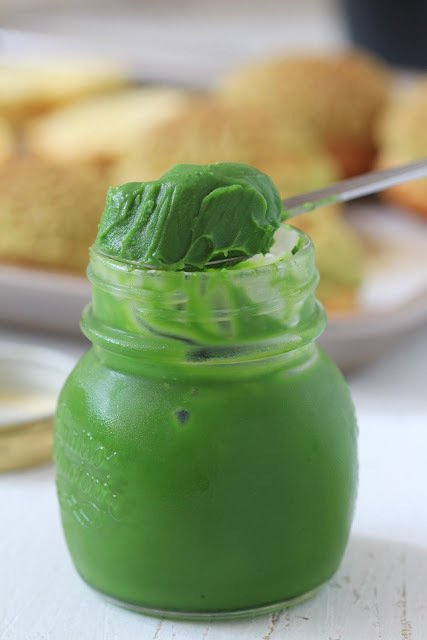 In a small bowl, sift in green tea and pour in hot water, stir until smooth; pour the mixture into the saucepan. Cook over medium heat, stirring constantly, for about 14 minutes until thickens, it will thicken further as it cools down. Transfer to a small sterilized glass jar, let cool at room temperature then chill in the fridge until needed. * Combine all ingredients above and rub mixture together until it resembles a coarse bread crumbs. Gather the dough and knead gently 4-6 times until smooth. Form into a 5-inch square and cover with plastic wrap, chill in the fridge for at least an hour or overnight. 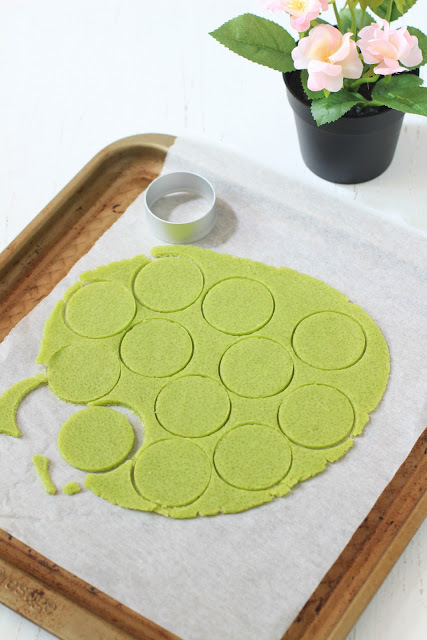 * Roll dough to 3mm thick between two sheets of parchment paper, if the dough is still a bit hard to roll, leave it for a minute or so before rolling it again. * Using a 4.5cm cookie cutter, cut 10 circles, wrap the remaining dough for future use, chill in the fridge until needed. * Preheat oven to 190ºC. * Combine the milk, water, butter, sugar, salt and vanilla seeds in a saucepan and bring to the boil. Take pan off heat, add in the flour in one go and stir mixture vigorously; return pan to the stove and cook over medium heat for 1 minute to dry out the dough or until it pulls away from the side of the pan. * Transfer the dough into a mixing bowl and using an electric mixer (or a wooden spoon), stir mixture over low speed for 2 minutes or so to cool down a bit. * Gradually add in the eggs in 3 additions, beating well after each and scraping the sides of the pan as needed. Dough should be smooth and glossy. * Using a piping bag with 1/2 inch round tip, pipe about 4.5cm balls onto the baking sheet lined with baking paper. 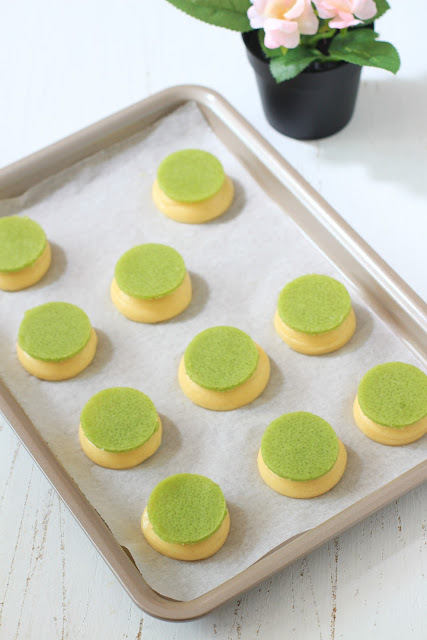 Top each choux dough with cookie dough circles, pressing down gently. * Bake for 35 minutes or until golden brown. 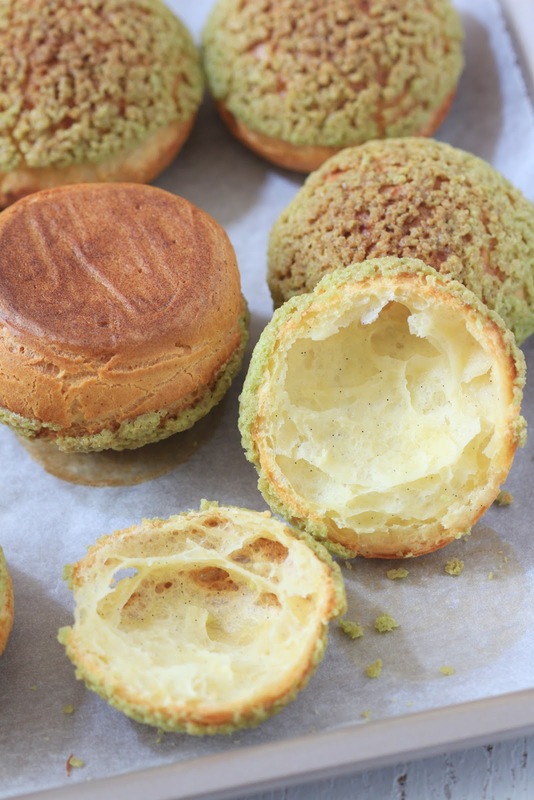 * Take out the choux from the oven and turn the oven off. Use a small pairing knife to pierce the side or bottom of the choux to let the steam escape. Place back the choux into the oven and let them dry out for 15 minutes. Cool completely. * Whip cream until slightly thicken, add in the milk spread and continue beating until stiff peak forms. Chill in the fridge until needed. * Slice off the top, about 1/3 or 1/2, depending on your preference, of the choux. 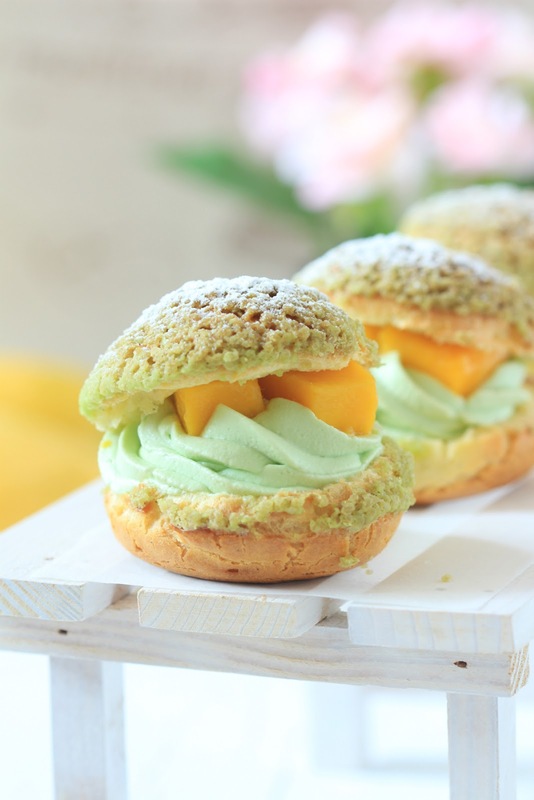 Transfer whipped cream to a piping bag fitted with a star tip and fill in each choux, add in fresh mango slices and top it with the other half of the pastry. Do the same with the remaining choux. Consume immediately. Ha! * Choux won't stay crisp for a long time, maybe about an hour. Fill the choux just before serving. Hi Anne :-) Nice to see you update the blog. Pretty and delicious as always!